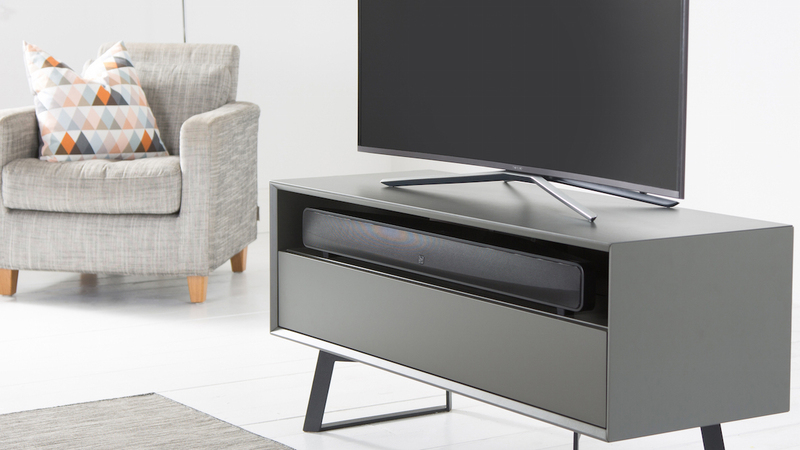 There are many reasons why it’s worth upgrading your entertainment set-up at home with a top-of-the-range new soundbar. The best being that, if you’re lucky enough to own on of the latest 4K TV screens, you really deserve to invest in a device that’ll deliver the top quality sound to match. 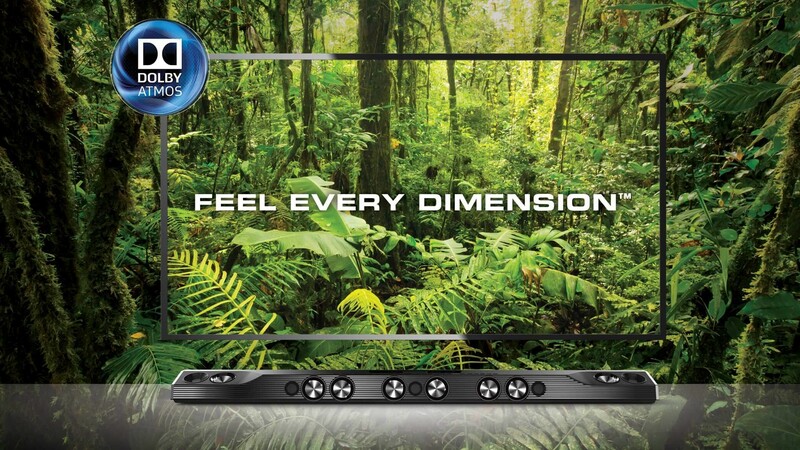 TV displays are getting slimmer and slimmer by the day. Although this means they’re more likely to fit in awkward spaces and cause anyone who’s visiting your home to gasp in amazement, it does mean their built-in speakers tend to be lacking. That’s why the obvious answer is an all-singing, all-dancing speaker system. 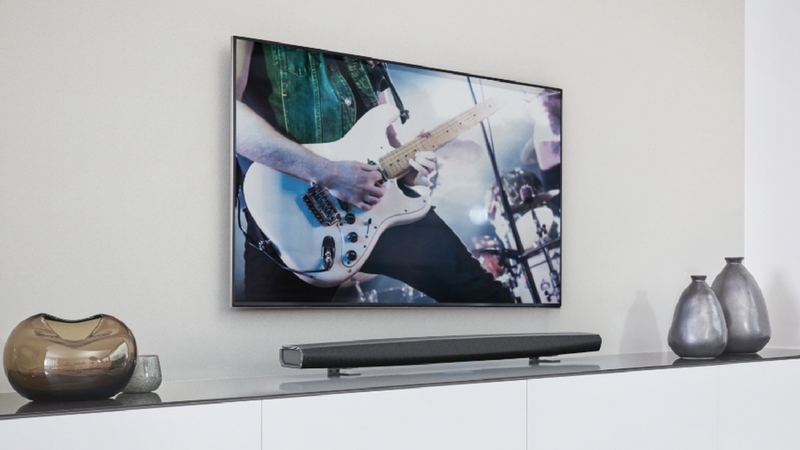 If you’re one of those people who admires the slim aesthetic of your new TV over everything else, then a good soundbar is your best option. 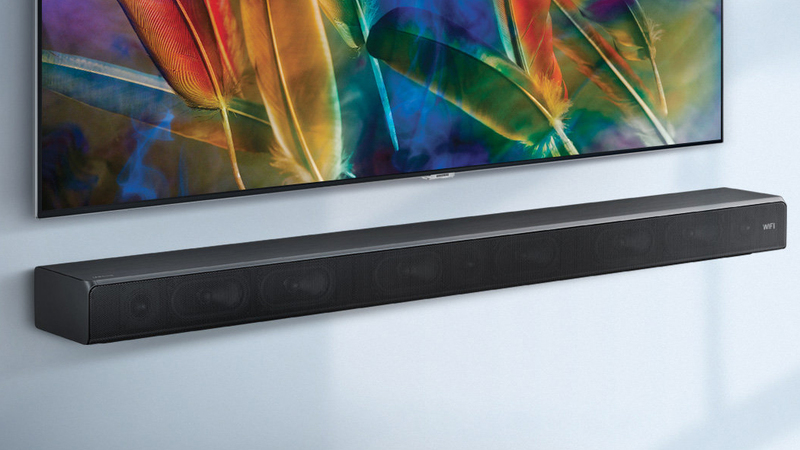 The top ones won’t stick out next to your shiny new slim screen like a normal stereo system would – the best soundbars are built to be just as aesthetically pleasing as they are aurally pleasing. The majority of soundbars on this list are made to sit in front of your screen, but they can also be wall-mounted above or to the side of it as well – giving you ultimate choice as to how your home entertainment set-up looks. 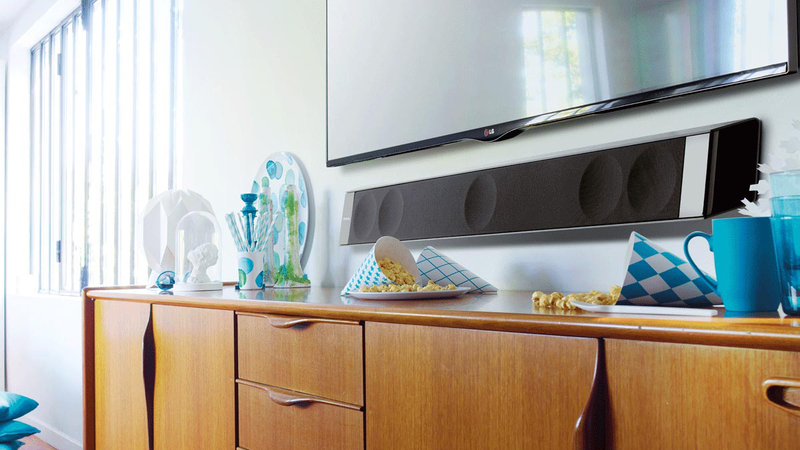 Not only are they slim and powerful, soundbars are also a good solution for smaller homes and rooms with little space that wouldn’t be able to squeeze a 7.1 channel speaker system in. 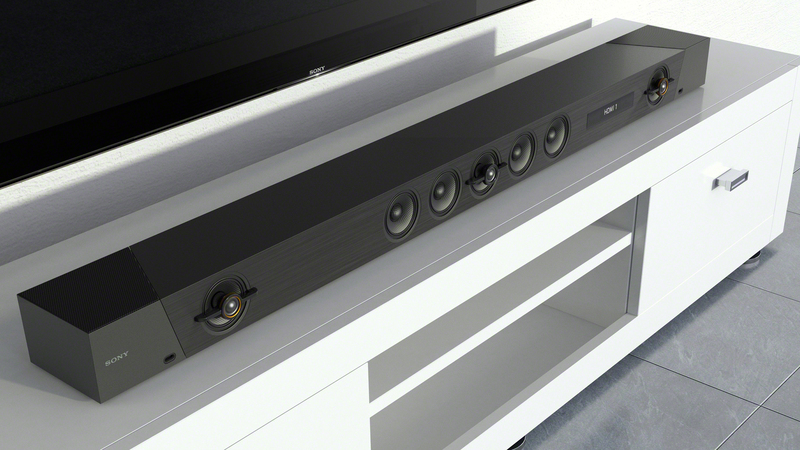 Despite most only featuring front-facing speakers, soundbars are able to confidently project sound in a way that makes it seems as though there’s booming audio coming from most directions. The problem with soundbars these days is there are lots to choose from. If you don’t find the right one for you, you can end up with a soundbar that doesn’t fit with your home theater setup – or barely sounds better than your TV’s built-in speakers. 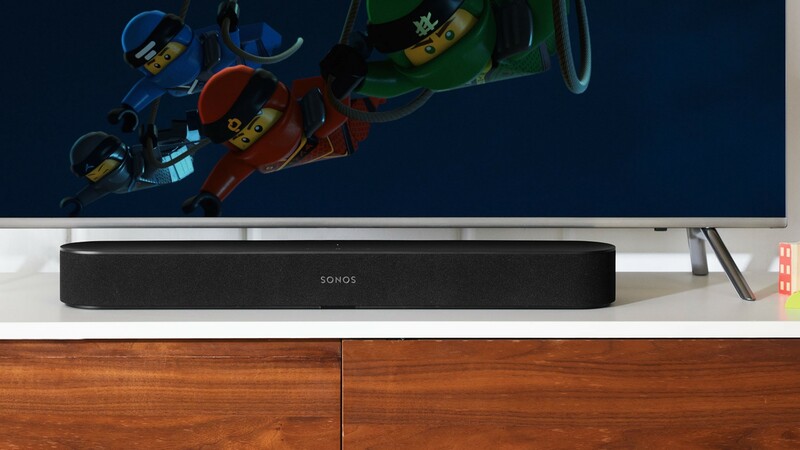 Read on below for the best soundbars available to buy in 2019, whether you’re after Dolby Atmos support, multi-room audio, or any variety of other advanced features alongside your soundbar’s premium audio experience. What’s the best soundbar for the money? We can’t stress this enough: when it comes to soundbars, there’s a lot of choice. 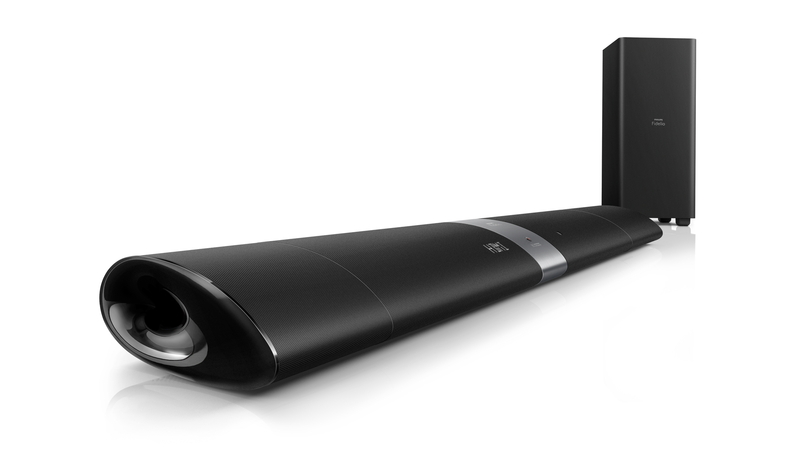 Despite being called soundBARS, they tend to come in different shapes and sizes. They also range in price from under £100/$100 to over £1,000/$1,500. Of course a full surround setup is the premium solution to bad sounding televisions, but if you’re short on space (as well as budget) then a soundbar offers a good compromise. More than that, these days higher-end soundbars will also include the latest and greatest audio technologies like Dolby Atmos and DTS:X. So it’s not like you’re getting a sub-standard experience, just a different one. But, above everything stands the South Korean manufacturer’s HW-MS650. 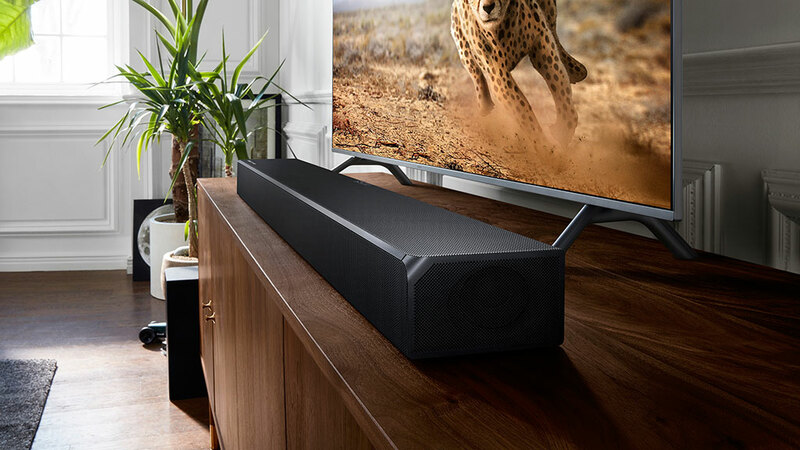 No other one-body soundbar has combined so much raw power with so much clarity, scale and, especially, bass, or excelled so consistently with both films and music. It’s the sort of performance that only genuine audio innovation can deliver – and with that in mind, it’s well worth its $450/£599 price tag. The Samsung HW-N950 is something special. 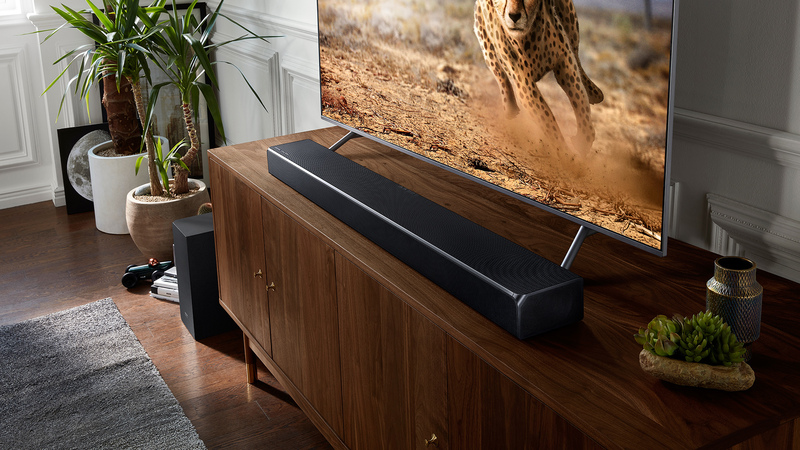 It’s the latest flagship soundbar from the company, but the first to benefit from Samsung’s acquisition of Harman Kardon – a partnership that’s already paying dividends. The HW-N950 is a whole-hearted upgrade on our previous award-winner, Samsung’s HW-K950 – which long held the #6 spot on this list. Most importantly, the N950 now supports both Dolby Atmos and DTS:X, compared to the K950 which was disappointingly limited to the former. The Philips Fidelio B5 is an impressive bit of kit, and it’s the perfect soundbar for someone who appreciates good cinema sound but has no interest in tearing up their living room to install a 5.1 surround sound system to use only every now and then. The B5 enables you to pick and choose your movie moments, and do it on a whim. And it creates a pretty decent surround sound experience too, using both Dolby Digital 5.1 and DTS Digital Surround decoding. 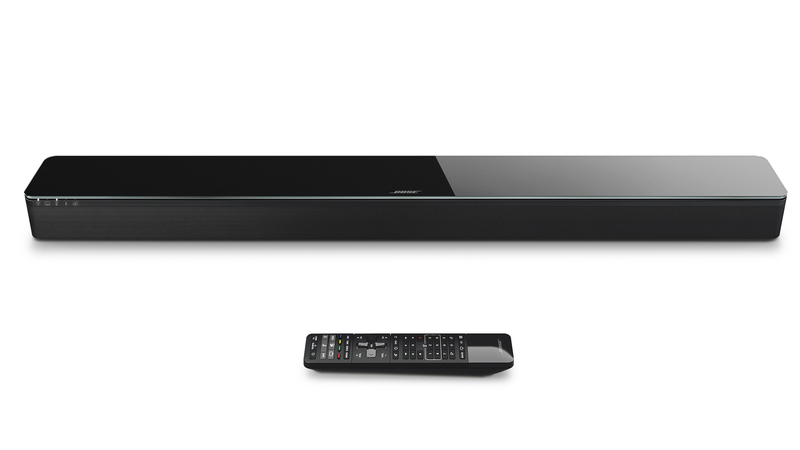 The combination of convenience and good audio – the raison d’etre of the soundbar – with its transformative surround sound capabilities makes the Fidelio B5 a great option for the movie fan who can’t face all the aggravation of a proper 5.1 installation. Unfortunately although it’s optical-only setup will be great for most, it does exclude owners of TVs that lack this connector, which has pushed it a little further down this list. The Sonos Beam doesn’t offer earth-shattering bass and the lack of Dolby Atmos support will irk some, but at this price point it’d be more of a surprise if it had been included. The voice control may be Alexa-only for now, but it works well and if you have adopted some of Amazon’s TV toys, it really is worth experimenting with. Blessed with such a balanced soundscape, the HEOS Bar proved immediately adept with music, and has a consistently warm yet refined sound quality that’s all its own. The fact that it lacks the opportunity to tweak the audio settings is not as important as we had feared. Music sounds superb, especially lossless tunes, from which HEOS Bar drags out a lot of detail. However, we did notice on a couple of occasions that the first half-a-second was cut-off songs. At $1,399 (£799, AU$1,699) it’s not exactly cheap, but you’re paying for excellent build quality, sound and design. 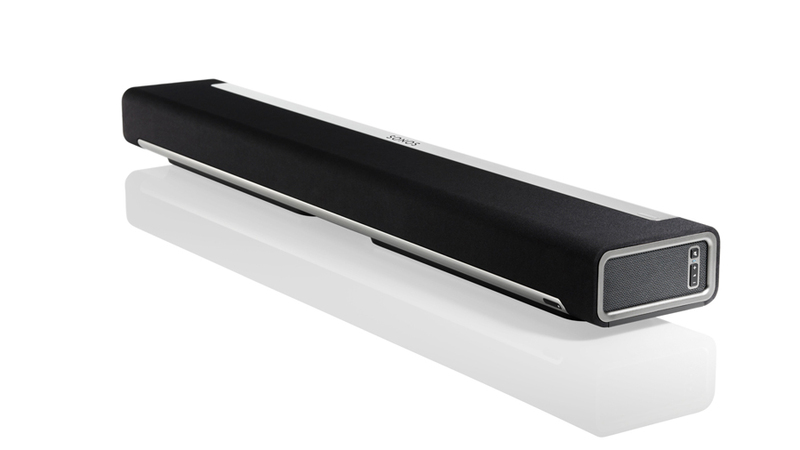 Boasting high-end design, Bose’s slim soundbar looks superb, and sounds above average. At 97.9cm wide, it’s best partnered with larger screen sizes (50-inch+) and priced at £599/$700/AU$999, it offers great sound. There are caveats regarding usability and price, but overall it warrants a cautious two thumbs up. It’s also worth mentioning that, as this isn’t a 2.1 package, there’s no subwoofer supplied – although Bose will sell you a wireless Acoustimas sub and the ST300 can be partnered with the brand’s Virtually Invisible (i.e. small at 10cm) 300 surround speakers. The system is also compatible with the Bose SoundTouch wireless multiroom system which includes smaller Bluetooth speakers. You know, it just didn’t feel fair comparing the Creative X-Fi Sonic Carrier to other soundbars on this list. It’d be like comparing jet-skis to yachts. Is $4,000 too much to spend on a soundbar – even one as genuinely awesome as the Creative X-Fi Sonic Carrier? Probably. But is a few grand worth spending to turn your basement or garage into a club / near-cinema-quality home theater? Yeah. It is.